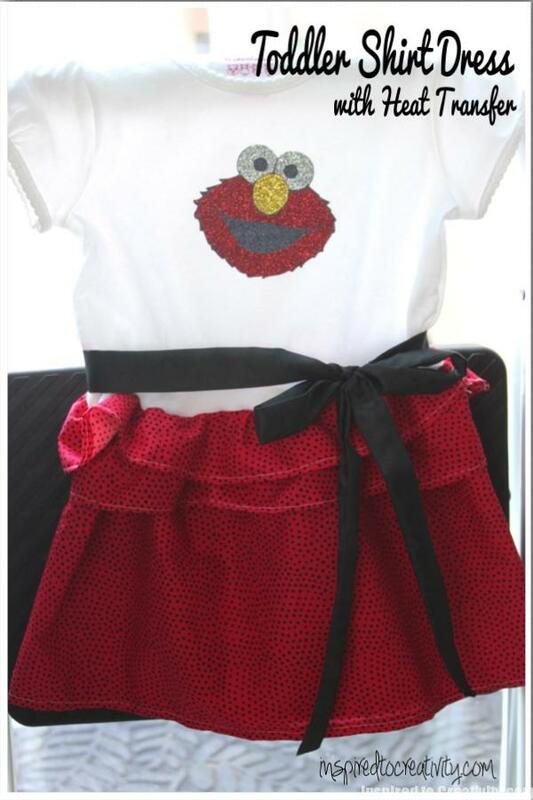 As a thank you to a friend for watching our cats while we were away, I decided to make a cute little dress for her daughter who loves Elmo. I saw this Ruffle Shirt Dress Tutorial on Pinterest and thought it was really cute. Unfortunately I couldn’t find any good colored tops, so had to use white, but it allows the Elmo to really let it stand out. The process to making this was pretty easy. The hardest part was figuring out how long to make the ruffles, and if I did it over again I would have made them much longer. After cutting out the fabric strips I hemmed all of the raw outside edges with a pretty small seam allowance. Then I used my serger to ruffle the fabric edges (great tutorial here). When all of the ruffles were done, then I cut the shirt down to a good size and stitched all of the layers on the wrong side. The black ribbon was just a strip of black satin scrap that I stitched into a tube. To make the Elmo head, I found a cute Elmo head SVG online and then cut it out using my Silhouette onto glitter heat transfer material. This design had a bunch of layering of the heat transfer material, but I was able to arrange it so that it was just 2 layers ironed on (black head base and then the head elements). I heard from my friend that the heat transfer started to peel off, so next time I would make sure to iron it on more. It’s always tricky with white not to iron too long.